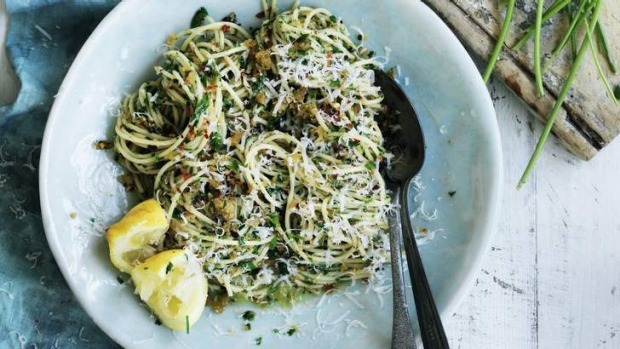 Spaghetti with garlic, pangrattato and olive oil. "Pangrattato" is basically Italian for breadcrumbs - so much more romantic! Good bread makes good crumbs, so I recommend using sourdough that's a day or two old. Boil a large pot of salted water, and cook spaghetti for about 8 minutes. (Check about a minute before the manufacturers' recommended cooking time, as you want the pasta to be al dente.) Drain, reserving a quarter of a cup of the cooking water. In a frying pan, warm olive oil to medium-hot, but not smoking. Add breadcrumbs, chilli flakes and a sprinkle of sea salt and sauté for about 5 minutes, or until breadcrumbs are golden. Add garlic and cook for another minute, toss in parsley and remove from the heat, then stir through lemon zest. Season with pepper and a little more sea salt to taste, then remove from pan and place in a bowl. Return frying pan to the stove and add the cooked spaghetti, a little more oil and the reserved cooking water. Toss well and cook for a further 30 seconds. Stir through lemon juice, mix well. Serve sprinkled with breadcrumb mixture and a liberal amount of parmesan.